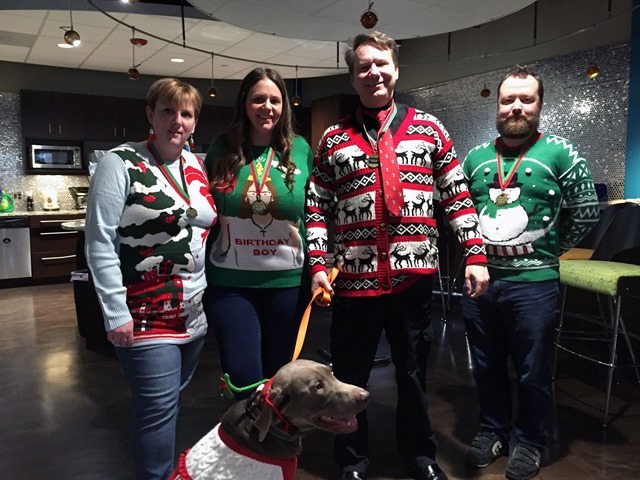 Stardock&rsquo;s Ugly Christmas Sweater Contest&ndash;The Winners Are&hellip;. Stardock’s Ugly Christmas Sweater Contest–The Winners Are…. Yesterday, Stardock had it’s annual Ugly Christmas Sweater contest. These are the….umm…..winners? Angie (KarmaGirl), Emily, Brad (Frogboy), and Brad (The_Gear). We also can’t forget Arrow the office dog. Lets give them a big round of…..applause. Yes, that is the real sad part. The Gear looks like he is just waiting for the picture to be done with. He has such a wonderful smile. Clearly a staged photo. The giveaway? KG without coffee. Nonsense. I vote for Brad's, it's ugly! Oh wait a minute. A sweater with "Birthday Boy" on it. Who did that young lady steal that from. Happy holidays to you all. After braving the sight of those 'sweaters' you deserve some ti e off. In a fugly sort of way.